PCTV Systems Broadway Watch LIVE TV on your iPad your TV, your way via WiFi, 3G. 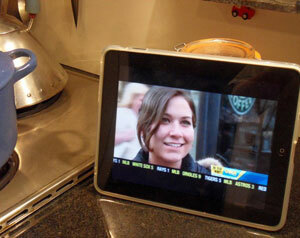 Introducing Broadway 2T the simple way to watch live TV on your iPad. Broadway is not only incredibly intelligent, its also one of the easiest to install dedicated personal video device that brings Live Freeview or Satellite TV to your iPad, iPhone or Android tablets with Googles new Android Honeycomb. When youre at home, Broadway sends the live TV signal to your iPad (or other supported devices) via your home Wi-Fi network. When you travel, Broadway sends the live TV signal via a 3G connection or, if youre in a place which has Wi-Fi service, via the local Wi-Fi connection. Watch your favourite TV programs while youre in the garden, sitting in the kitchen or anyplace in your home where you have a Wi-Fi connection. 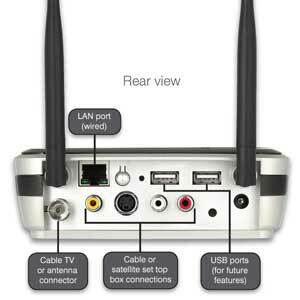 Watch TV on your iPad anywhere in your home where there is a Wi-Fi connection. And with one touch of the screen, the channel selector disappears and the TV programme occupies the full width of the screen. Setup of Broadway is easy. Connect Broadway to your TV aerial or set top box and connect it to your home router using the network cable provided. Then turn on your iPad, iPhone, MAC or PC and enter http://distan.tv into your browser. Scan for channels and then start watching live TV! Its that simple. To watch your TV when youre travelling outside the home, just configure your home router to allow remote access to Broadway. Not sure how to do this? Visit www.portforward.com where you get a step by step guide to walk you through it. Alternatively you can call our Broadway support team in the UK and well guide you through it free of charge. If your TV aerial or set top box is not near your router, dont worry. After the initial setup, Broadway will wirelessly connect to your router. Simply move the Broadway to your TV aerial or set top box, enable Broadways wireless connection to your router, and youre all set!